Was planning to do laundry and watch a creepy movie, but mom invited me to dinner so I visited with my family a bit tonight which was nice change of pace after hermiting around the house for 4 days straight. Allergies are really starting up now! Leanne - that does sound like allergies. It's always nice to get out for dinner. The government also recently changed the passport expiration to 10 years, it used to be 5 before. License is still 5 years. That's the same here. I think there's a 1-3 month grace period for renewal if you let either lapse, but after that, you have to start all the paperwork from scratch. Leanne, do you have allergies? I've got a food allergy as well as dust & pollen allergy. It runs in the family. Chris, it's the same here. Plus it's renewal so should be fairly easy/no hassle. I remember I got scolded (teasingly) for the lapse in renewing my drivers license before and had to pay the additional cost (so my license was twice expensive that year) and vowed never to miss out on these things again. Out license renewals are linked with our birthdays, so once you get the notice, it's not to hard to remember the date Passports are separate and depend on when they were issued. Anybody have plans for the weekend? I'll be watching the World Figure Skating championships. I want to watch a specific movie tomorrow on tv called The Meg, something about a giant shark (?) exciting plans so far! I’m also still slowly decluttering and trashing junk I don’t need! Chris, yeah driver's license expires on our birth date and yet I still forgot. I might go out and have dinner or movies with some friends. Have a great weekend! Leanne, oh bless. I'm like you as well, I sneeze a lot. Both my dogs have skin allergies too. I'll have to chalk it up to the weather here. LOL, I've heard about The Meg. I haven't seen it but my friends loved it (I have a friend who loves all the Sharknado movies). We like watching B-movies for laughs, it's fun. Our weather bureau finally declared the start of summer here yesterday even though it feels like summer already since the start of this month. Blech. It's spring for us, and this weekend the forecast looks like it will actually feel like spring. Good luck with that! I try to do that occasionally, but never manage to get rid of much. Once it's summer for you over there, it's rainy/typhoon season here. Happy weekend everyone! Having a lazy Sunday morning today but might go out for a movie later. Today was a lazy Sunday for sure. But I went over to my parents condo to have pizza and then dye my hair! Chris, yay for lazy Sundays! Leanne, what color did you dye your hair? I'm bringing this over from the HP OT thread because it's been a hoot finding out everyone's answers so far. Leanne - pizza is always good. Hope you're happy with your hair. Lindsay - shrimp, crab, lobster would be on my can't stand list. Yeah, it’s a “cool medium brown” shade, but it always looks darker the first few days. I think my food would be raw oysters in the shell. I don’t get how so many people can eat them raw and stuff what’s yours, Lindsay? I’m just in the mood of being energetic and getting things done at home today, weird for a Monday but I guess it’s cause I’m not at work! and my coffee really helped out there! Chris, what? They're my favorite but I'm allergic so I can't eat them. Leanne, I eat that but they have to be grilled and served with lemon-garlic butter. Eating them raw won't cut it for me. But I do eat some raw food (like sashimi) so I'm selective when it comes to raw stuff. 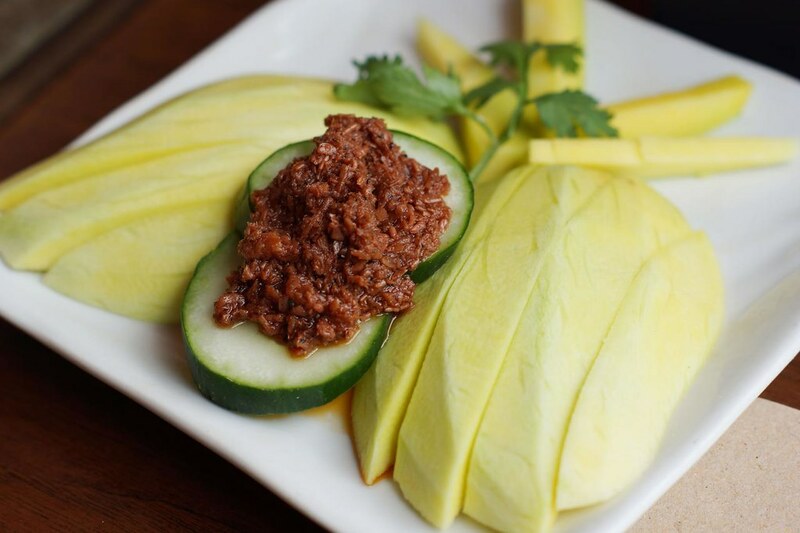 For me, I don't eat green mangoes with shrimp paste. A lot of people eat those here and I can't stand them. I’m having butter chicken for dinner thanks to my SIL sharing what she’s making. Love that dish! Had to take my cat to the vet, he was good during the physical exam but he was mad as hell in the back during a blood draw. So weird when you hear your cat yowl and scream with his voice when he never does it otherwise! poor guy, now he’s been sleeping the day away cause that’s what vaccinations do to him, make him all drowsy.